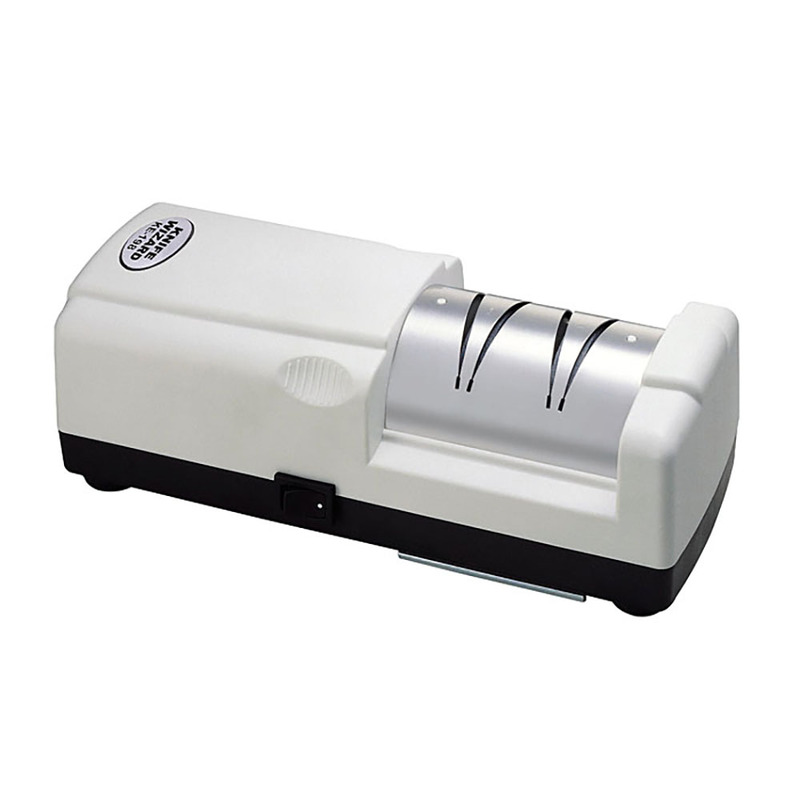 The Knife Wizard KE198 electric sharpener is absolutely perfect for domestic household sharpening. There are 2 wheels inside the machine made of aluminium-oxide. There is a coarse wheel and a fine wheel. Both wheels have been loaded onto springs, so they react to the thickness of the blade being sharpened; therefore if you have a slender blade like a Paring Knife or a Filleting Knife, the wheels won’t move as much as if you were sharpening a cleaver or a thicker chefs knife. Each wheel has 2 slots. The left-hand slot sharpens the right side of the blade and vice versa. Not all knives have double bevels and this machine allows you to choose which side of the blade you would like to sharpen. For example, some fish knives, Sashimi knives and Bread Knives have a bevel on one side and a flat side on the other. The slots are angled at 15° (which is a Japanese angle) and this machines or restores a perfect and precise cutting edge. Knives will typically be sharpened in less than a minute and because they have an exact angle on both sides of the blade, edge retention is approximately 10 times longer than if you were using a manual, non-angle controlled method; thus increasing the life of your knife! There is a tray at the bottom of the machine which collects the sharpening dust and the wheels come with a 10 year guarantee.